The arrowhead is made of bronze, in a flat, lanceolate shape, while the tang (the bit that gets inserted into the shaft) is slightly thicker, with a rhomboid midsection. Tip-to-tang, the arrowhead just tops 6 ½ cm and weighs about 9 grams. This type of arrowhead is well known throughout Israel and surrounding areas, with examples discovered in Megiddo, Kadesh Barnea, and more. 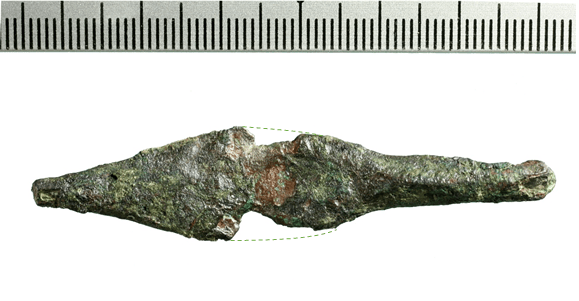 This type of arrow remained popular for several centuries, but Late Bronze Age archers seemed to prefer longer arrowheads, while in the Iron Age IIB, bronze arrowheads become scarce, and their tang would have a circular midsection, leaving our arrowhead nestled comfortably in the middle in the 10th century BCE. To this date, less than a dozen such arrowheads have been discovered within 10th century BCE contexts throughout the country, but this speaks less of the arrowheads and more about the period in general. The 10th-9th centuries BCE are notoriously hard to pin down in an excavation for one simple reason – peace. As opposed to periods that ended violently, leaving behind entire destroyed and abandoned cities, the transition from the Iron Age I (the 12th-11th centuries BCE) to the Iron Age IIa (10th – 9th centuries BCE) was nonviolent – arrows went unfired, pottery went unsmashed and anything broken through normal use wasn’t left lying around on the floor in order to make the archaeologist’s job easier, but found its way to the city dump, such as the one we have discovered on the eastern slopes of the Temple Mount, which indeed contained copious amounts of pottery dating mostly to the 9th Century BCE. But let’s leave the arrowhead for a moment and focus on the Temple Mount – what did it look like during this period? Not much is known about the Iron Age I (12th-11th centuries BCE). The city of Jerusalem was controlled at the time by the Jebusites, a group of possibly Hittite origin, who are only known to us from the Bible. The Temple Mount itself was outside of the city proper, and was utilized for agricultural purposes, such as Araunah’s threshing floor, which we’ve previously discussed. The Iron Age I draws to a close around 1000 BCE with the founding of the Davidic dynasty and the conquest of Jerusalem. As opposed to the city itself, the Bible tells us that the nearby hill, which will come to be known as the Temple Mount, wasn’t conquered by force, but was purchased from Araunah, King of the Jebusites. According to the Biblical account, King David only built an altar on said hill. It was his son, Solomon, who expanded the city to include the Temple Mount, and built upon it a royal compound, with numerous buildings listed by the Bible (1 Kings 9): the Temple itself (The House of God), the House of the King, the House of the Forest of Lebanon, the House of Pharaoh’s daughter, the Great Courtyard, and the Other Courtyard. The text also mentions several halls (Hall of the Throne, Hall of Pillars, etc. ), but it is unclear whether these are separate buildings, or rooms within the buildings previously mentioned. The entire complex stood atop the Temple Mount, renovated from time to time, until the destruction in 586 BCE. The issue of the historical accuracy of the Bible has been the subject of much heated scholarly debate over the last few decades; some simply accept the Biblical description as historical fact, others dismiss out of hand the idea of gleaning any historical data from the Scriptures. The vast majority of academic scholars are situated somewhere between these extremes, and carefully try to tease out historical meaning from the text. The description of the building of the Temple Mount complex given in 1 Kings includes many dry, technical details: building materials, measurements, adornments, etc. The buildings’ layout and techniques fit nicely with what we know of buildings of the period from the Ancient Near East, leading credence to the notion that the Biblical author based himself on authentic documents from the Temple archives. Towards the end of the 10th century BCE the Temple Mount saw a decline in opulence. The Bible tells us that King Shishak of Egypt marched upon Jerusalem, and King Rehoboam placated him by delivering the treasures of the Temple and royal palace. Back in Egypt, Pharaoh Shoshenq I recorded a military campaign (ca. 920 BCE) on the walls of the Temple of Amun in Karnak, Egypt. There, the capitulating city of Jerusalem is not mentioned among the list of conquered towns, but despite the discrepancy, this is still considered the first Biblical event to be recorded by external contemporary sources. Until recently, the only source of information regarding the Temple Mount in this period was the Biblical text itself. The lack of archaeological data allowed for the profusion of different theories, which remain untestable. The Temple Mount Sifting Project has uncovered several artifacts that help paint an archaeological picture of the Temple Mount in the early days of the Kingdom of Israel. We have discovered a fair amount of pottery datable to this period, mainly hand-burnished bowls and cooking pots. Comparison of the amount of pottery sherds leaves no room for doubt – this is indeed the period that saw the beginning of intense human activity atop the Temple Mount. A few other artifacts provide us with glimpses into the types of activity that said inhabitants might have been engaged in. The arrowhead with which we opened might have belonged to one of the Temple or palace guards. Administrative activities carried out within the royal compound might be reflected by a rare cone-shaped stone seal depicting a pair of animals (read more here) and a bronze weight carrying an early Hebrew inscription, purportedly discovered on the Temple Mount a century ago, while various finds from the garbage pit on the Temple Mount’s eastern slope and from the Ophel excavations all add up to paint a colorful picture of the diverse human activity taking place atop the Mount at this time. Until such a time that a proper archaeological excavation will take place at the Temple Mount, we won’t know if there are any structural remains from the Iron Age IIA. However, in the eastern wall of the Temple Mount complex, there are some parts that clearly predate Herod, and have been suggested to date to the First Temple Period by some scholars. Given that – they may very well date to the Early First Temple Period. Apart from the Temple itself, this period saw the Temple Mount as home for the kingdom’s governmental center that, at least in term of acreage, dwarfed the Temple and is likely the source of most of our recovered artifacts. However, irrespective of its size, the Temple was a source of inspiration to all activity conducted in nearby public buildings and governmental institutions. The Bible ascribes to the Temple a central part in the people’s religious and national life. Tithes and offerings were brought to the Temple, and there the people gathered three times a year and directed their prayers towards from afar. Such a place would have cast a light on any cultural, economic, administrative and judicial act carried out nation-wide. Any conflict would have been resolved therein, and from hence the Torah would be dispersed among the Nation of Israel and the world. Did this utopian vision actually take place at any point during the First Temple Period? Does archaeology have anything to add to this question? Stay tuned for the next blog post in the series, as we move on to the Late First Temple Period! The Temple needed “live” water. Where it came from? Gihon is the only spring in Jerusalem but it lies lower than Har Habayit. Where the Temple stood? The temple most definitely did not have a running stream in it. During one week every year, when “live” water was needed, it was retrieved from the Gihon spring. The 4th chapter of tractate of Sukkah describes the procession up towards the Temple. During the rest of the year, water was available by cisterns and aqueduct. Thank you, Daniel. Mishnah Sukkah 4 explains how they went to the Temple with the Gihon water through the Water gate. No mention of movement up to the Temple. As for the aqueduct, the first one was built in Hasmonean era at earliest. In the First Temple period there was no aqueduct to Har Habayit or to Ir David. Dear Richie, yet how was the (non-living) water supplied to Har Habayit? Who did it? The whole tribe of Gibeonites would work 24/7.